When I was growing up in New Hampshire we knew how cold and long the winters would be and would stock our pantry with snowstorm foods. These were foods that we could make on a cold snowy day, if the power went out (having a gas stove is a must!) or if we wanted to make a large meal and have plenty of leftovers. 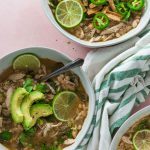 I always loved these meals and I was happy to combine what I know and something new to me and make a White Bean Chicken Chili. 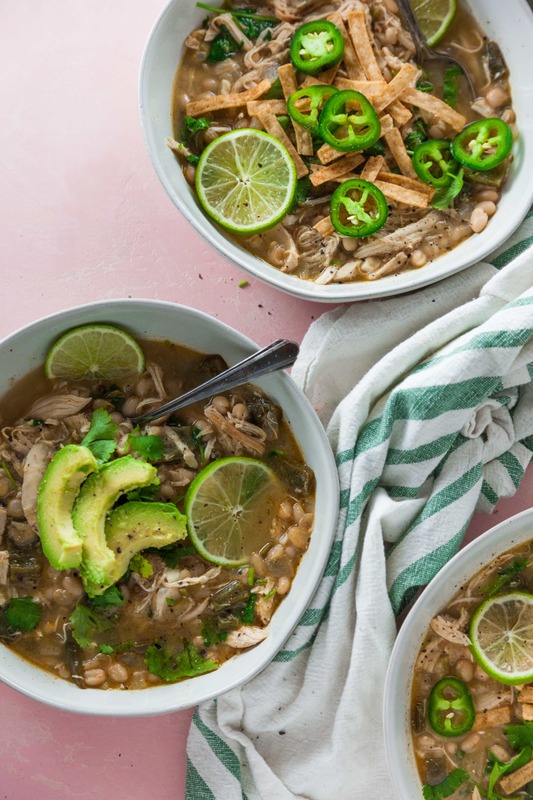 It’s cold weather meets California meets southwest heat and I really loved this dish. Chili is a simple and filling meal. 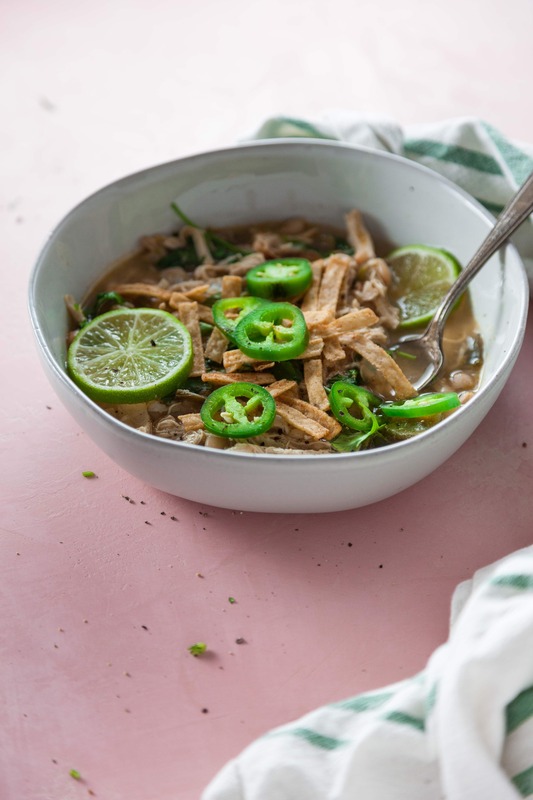 For this recipe most of the items are some of my pantry staples: canned beans, chicken broth, chicken. Of course you can cater this to your liking with toppings, but even without them this was a delicious meal. 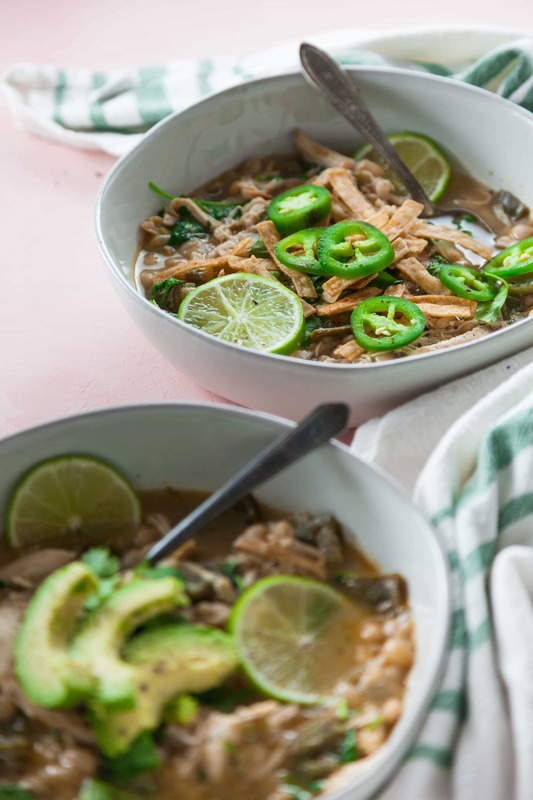 I topped mine with a combination of tortilla strips, avocado, sliced jalapeno, fresh cilantro, sliced lime and lots of seasoning. It was damn delicious. I usually make a red chili such as my BBQ Beef Chili but I wanted something a bit different this time around. This meal can also be made healthy with a few substitutions. Looks for low sodium canned beans and broth. There’s a good amount of sodium lurking in these and it’s an easy substitution to make. I also used rotisserie chicken meat for this recipe, but you could also use shredded baked chicken breast in this. 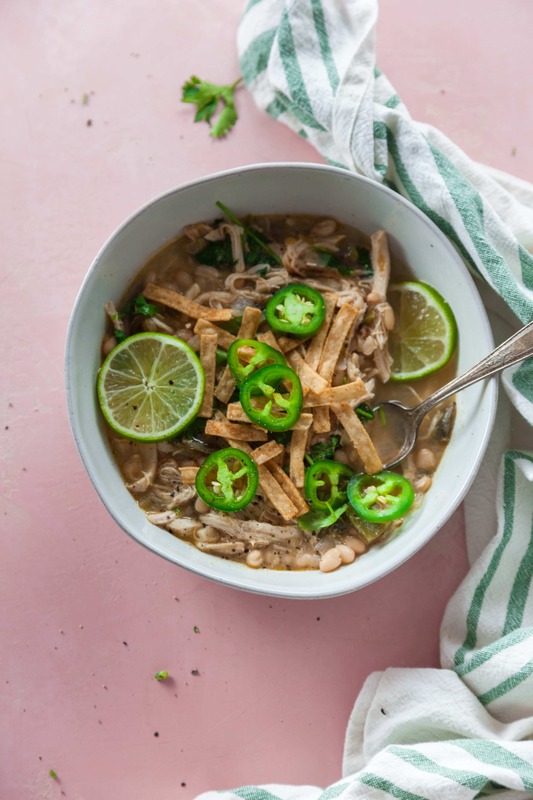 For toppings, load up on the veggies and omit the tortilla strips for a healthier option (although the tortilla strips add a great textural component). Right now I’m living in northern California which gets what I would call chilly. 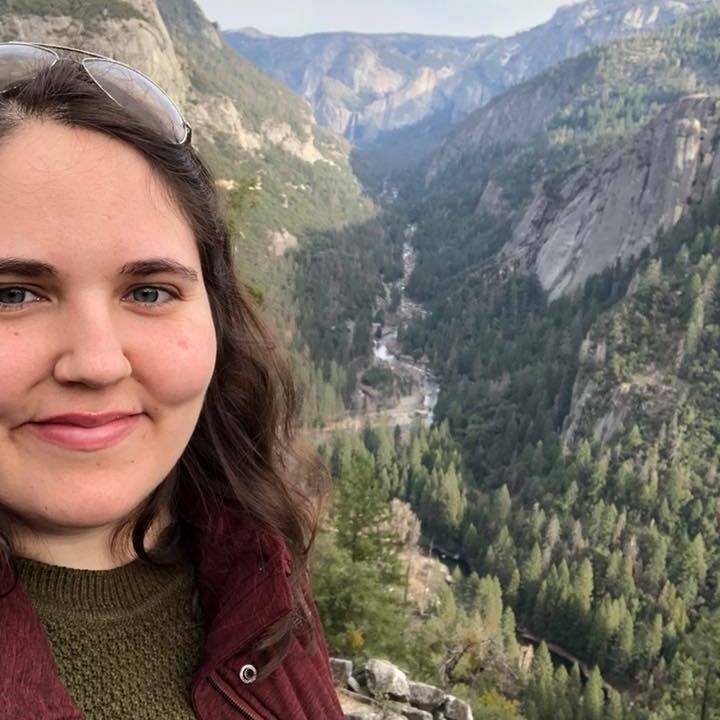 I miss the snow and having real weather because what we have out here is either droughts and fires or rain storms and mudslides. Throughout all of this, the weather in San Francisco stays a balmy 60 degrees year round. So while I miss the normal change of seasons, my food habits and desire for comfort food has not been altered. I think having cold weather food, no matter where I’m living, is going to be a thing always. 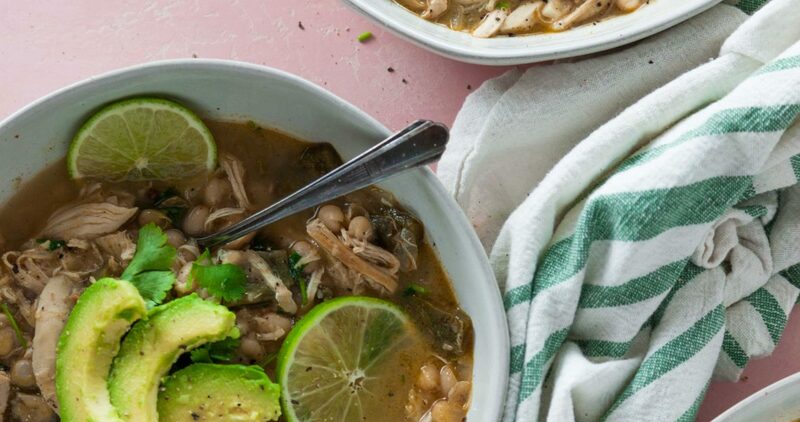 Escape the polar vortex with a big bowl of this White Bean Chicken Chili. It's sure to warm you up and is a quick hot meal! In a large dutch oven over medium-high heat, add oil, peppers, onion and garlic. Cook until peppers and onions have softened. Season to taste with salt and pepper. Add fresh cilantro and serve with your favorite toppings. Enjoy!